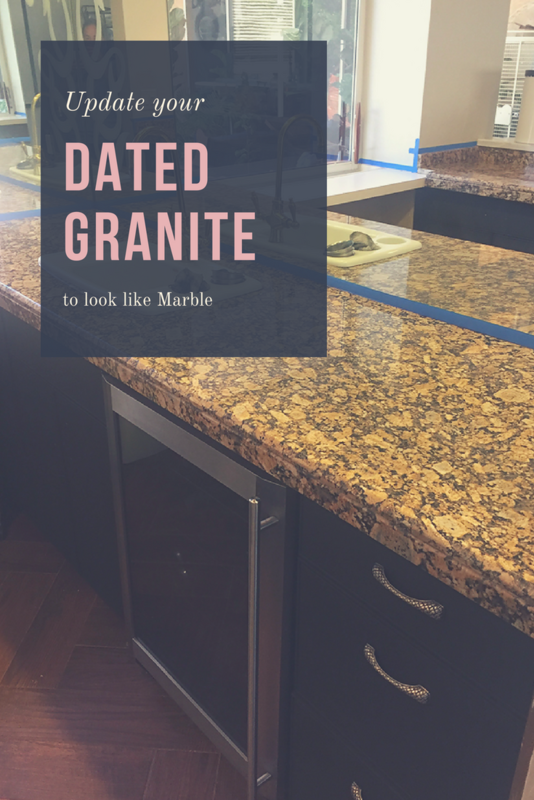 Have you ever wondered if you could update your dated granite counters without having to replace them? 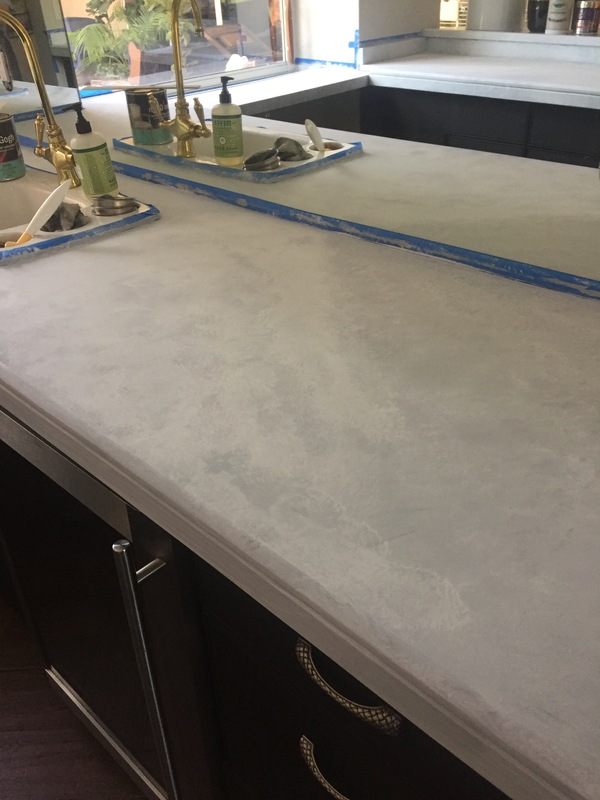 I did, and was able to give them new life when I updated them to look like faux marble counters. When we bought our last house, it had a ton of granite countertops, but all of them had lots of brown and cream. 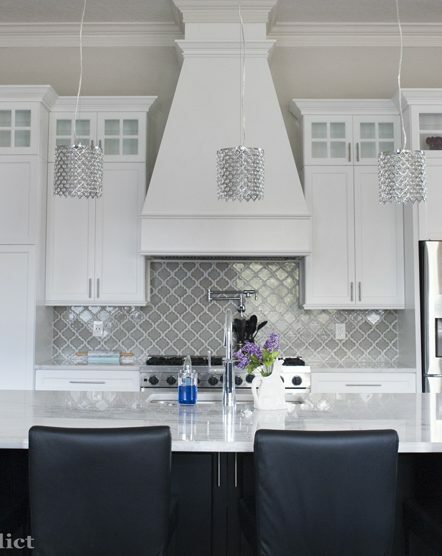 They didn’t “go” with all the new colors we put in the house – grays and crisp whites and bright colors. It would have cost us a fortune to replace them, and we didn’t have several thousand dollars to swap them all out. So I decided to paint them to look like faux marble counters. Yes, I know there are many who believe that I shouldn’t paint them, as mother nature took a bazillion years to make them. But it’s either paint them, or take them out and put them in the trash in order to replace them. This is the bar/wine/coffee area the day we settled on the house, before we did anything to it. 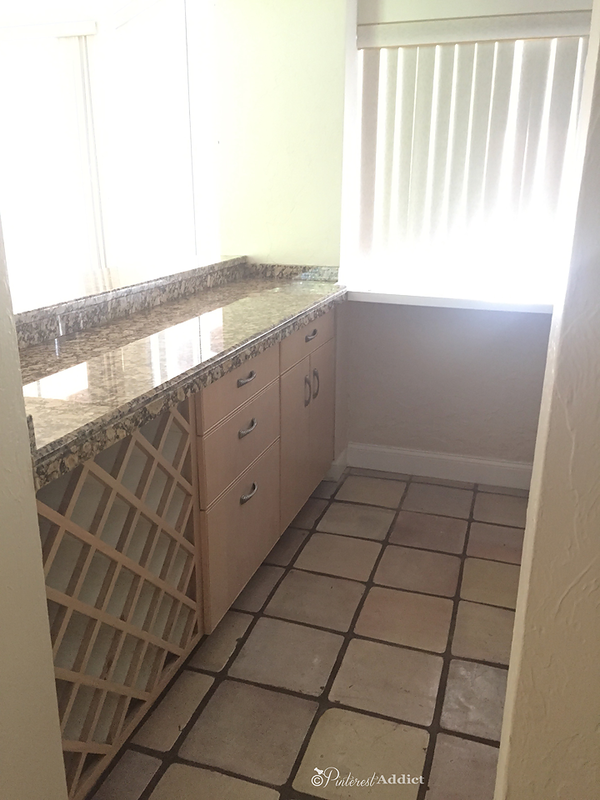 Gotta love the 1990’s cabinets and granite combination. And let’s not ignore that pretty embossed mirror. Ugh. After we replaced all the floors in the house, the first thing I did in this space was paint the cabinets black using Amy Howard chalk paint in black, and replaced the dated hardware. 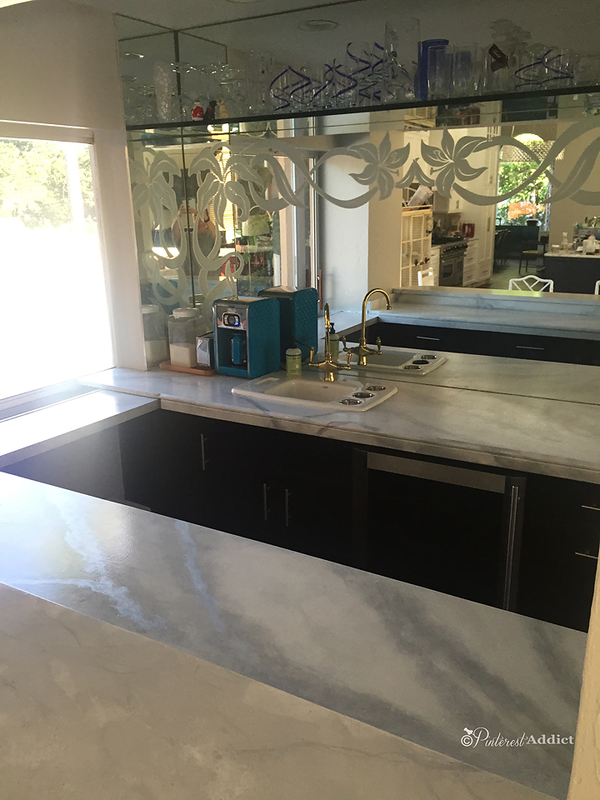 All of the counters I’m talking about are all in the great room area, which includes our new kitchen with quartzite counters that look very much like marble. 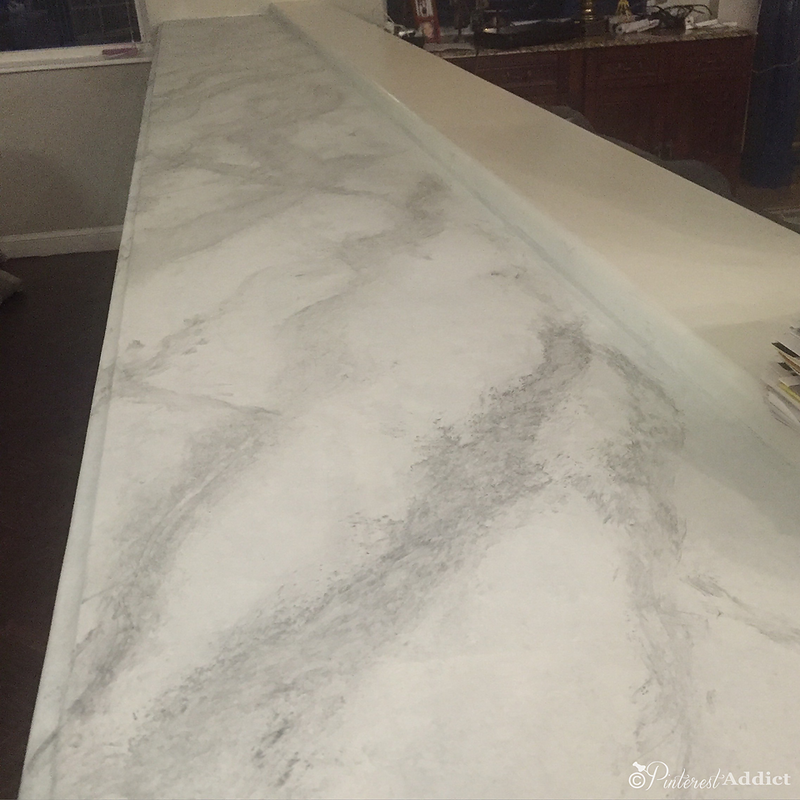 There are tons of tutorials out there to duplicate the effect of faux marble, and I tried a few different ways. One of the videos I watched was for a product called Giani’s Countertop Paint , and it gave me a good idea of how to start the process. Being that I am impatient and didn’t want to wait for it to ship to me, and they don’t carry that product at my local Home Depot or Lowe’s, I used what was already on hand. I did buy a glossy surface primer, but everything else I already owned. I began by wiping everything down, making sure I started with a clean surface. Then I primed the counter tops. I used Kilz Adhesion primer for glossy surfaces. I had it tinted with some black to make it gray. The right thing to do is to wait at least 24 hours for the primer to dry. And I did do that – after the first counter had to be started over since I went too fast. Wait. Just do it. 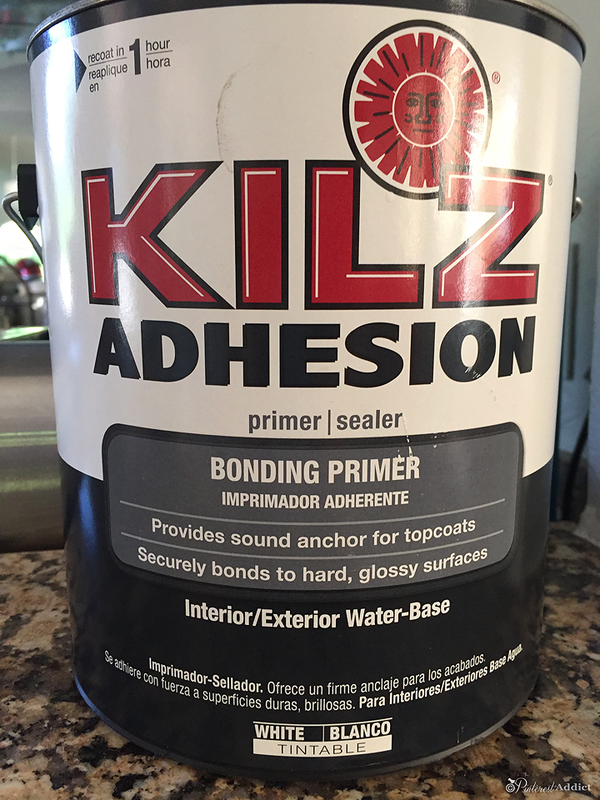 The coverage from the Kilz adhesion primer is awesome – it took one coat to completely cover the granite completely. I wish all paint was like that…. When it dried, I tried to scratch it off with my finger nail, and it didn’t budge! 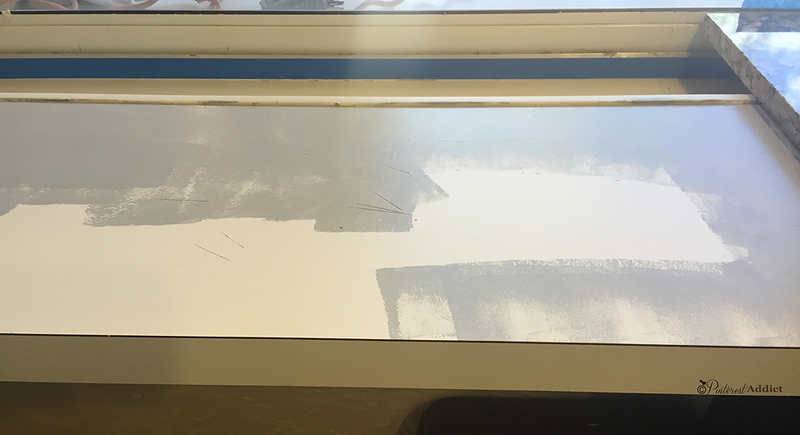 We also went over the small part of the counter that was melamine with the Kilz adhesion primer, and it worked great. It even filled in those scratches, so you couldn’t see them anymore when I finished with this process. Then I put the first coat of white over the primer. It was pretty streaky and splotchy, with the dark gray still showing through, but that’s okay. Let it dry for a few hours. It doesn’t matter that the coverage wasn’t smooth or covered 100%. In fact, it’s better because it adds depth to the end result. Then, go back with a big round brush or sponge, and give it another coat by blotting the white on top of the first coat. I wasn’t looking for perfect cover, I wanted a little bit of depth and interest. Let it dry completely. I took some of the silver and gray paint, dipped a feather in it, and ran it over the top randomly, creating veins. It doesn’t have to be perfect, because you will go over it a few times with more gray, white and other shades of white. Let it dry. After it dried, I went back with some watered down white paint and blotted it over top of the gray veining. I took a little bit of the pearl white paint, and put in a few veins of pearl to make it look opalescent and a little sprakly, like real marble sometimes is. And when i was finally happy with how the “marble” looked, I let it dry completely for a day or two. Then I put a couple of coats of sealer on top and let them dry for a few days before I put anything on top of them. They looked so good – and held up great to every day use. 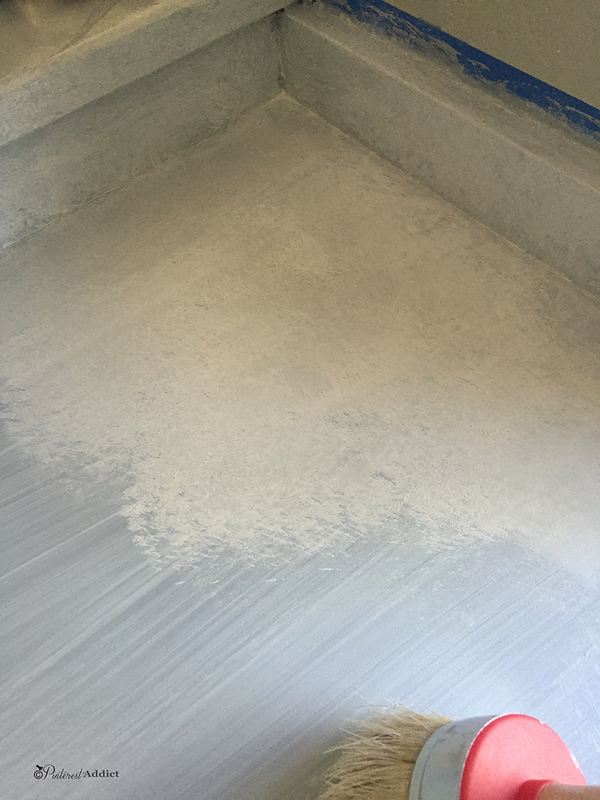 In the above picture, you can see how the pearl paint added a little bit of shine and depth to the finished counter. When people came over, they were always surprised to find out they were painted! Unfortunately, we moved before I could take proper “after” pictures with less glare, no mess and no painters tape left behind. But you get the gist, right? 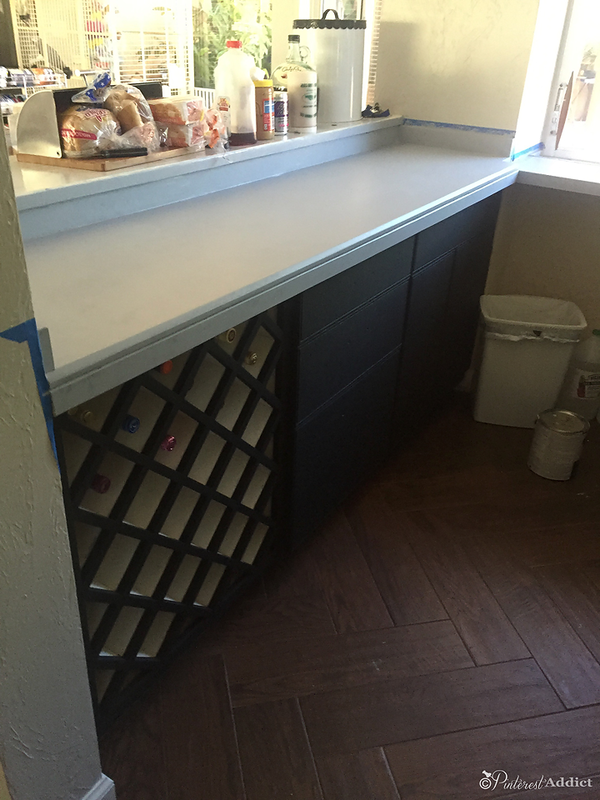 So, yes, you can paint over ugly granite counter tops and make them a thing of beauty. Wow! Fantastic job!! Those are completely stunning! Thanks I also have a new house (2years old) with really ugly granite countertops in kitchen. I am so happy you posted this, everything is builders grad, your cabinets are exactly what I want to do. Hi Elisia! 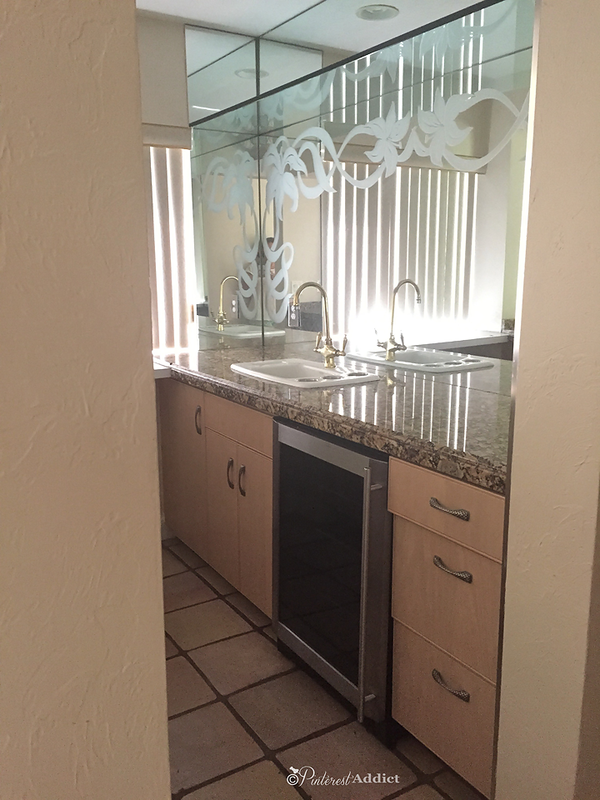 Your counters look great! Thanks for the tutorial. 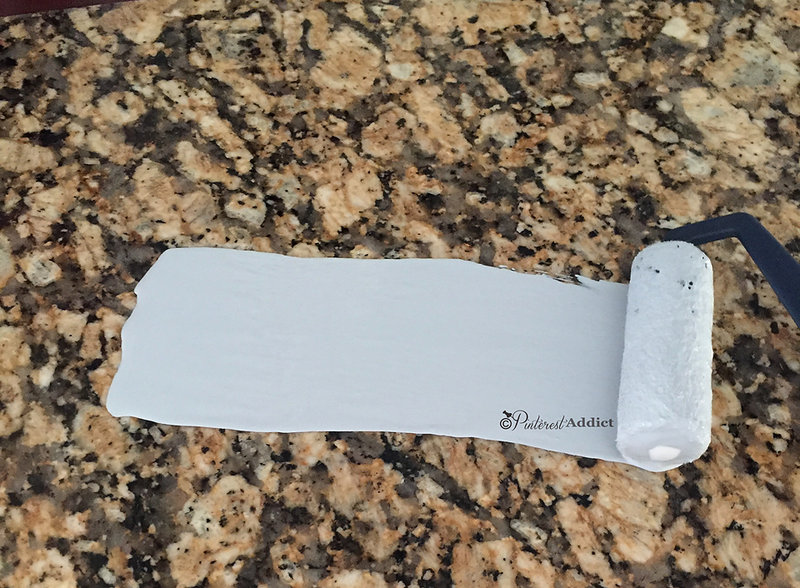 When we moved into our outdated house 14 years ago we decided to use the primer and paint technique (just a solid color) for our kitchen backsplash “for the time-being”. Well, we never have done much else to it but the paint has held on to the tiles wonderfully. Have you moved from this house? You were one of the first people I know to do the herringbone wood tiles. Hi! The counters turned out beautIful! After you Used the kilz primer, what brand and tyPe of paint did you use to finish? Thanks! Hi, I’m a bit confused. 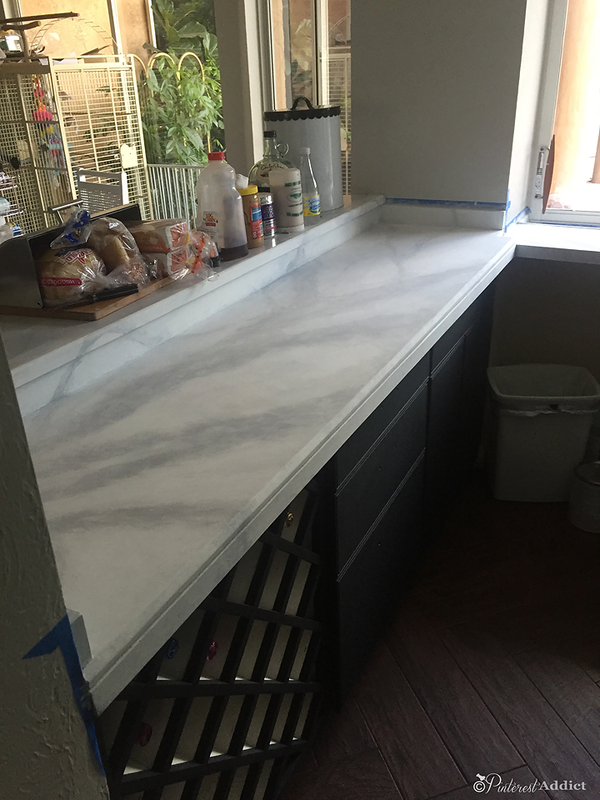 Did you use quartzite or a DIY. 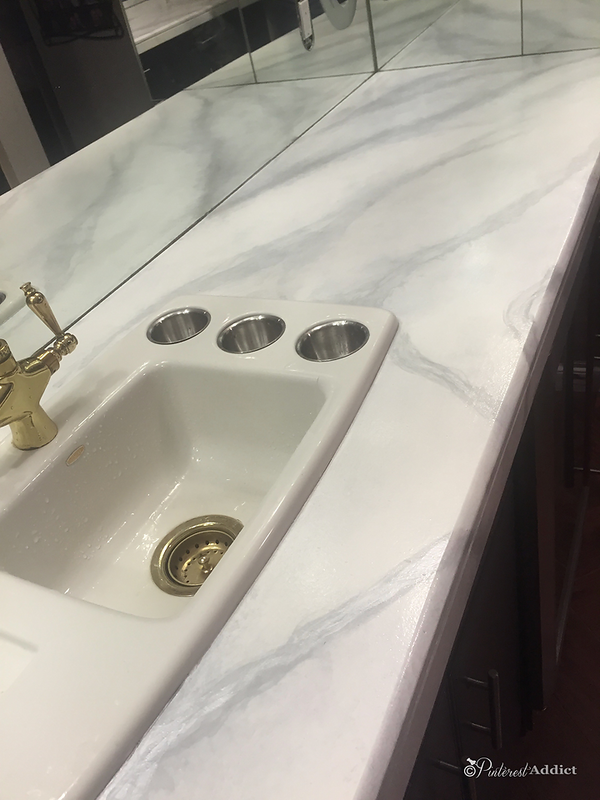 Also one of the pictures show a countertop that is chiseled at the edge. 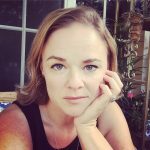 Were you working on two projects? 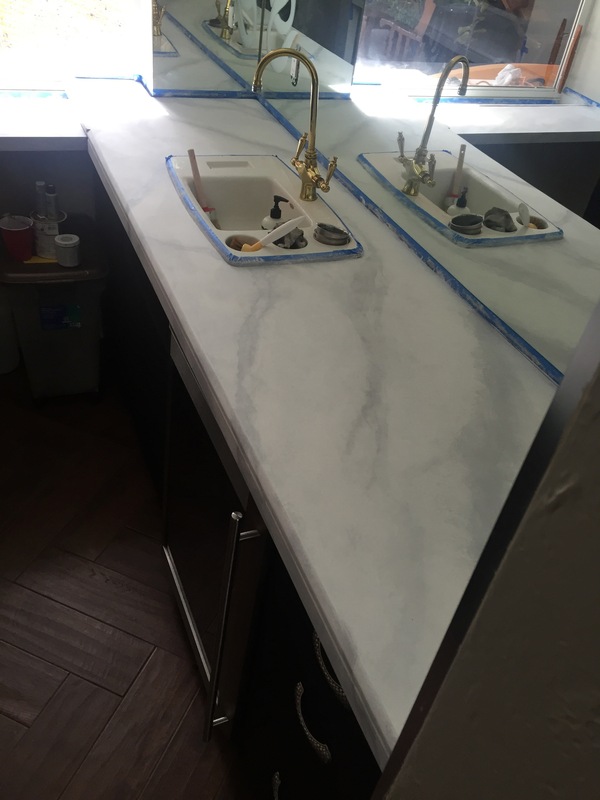 I painted existing granite counter tops in the bar area to look like marble. They had a chiseled edge already. I also did the same thing to a small piece of melamine counter in the same area. 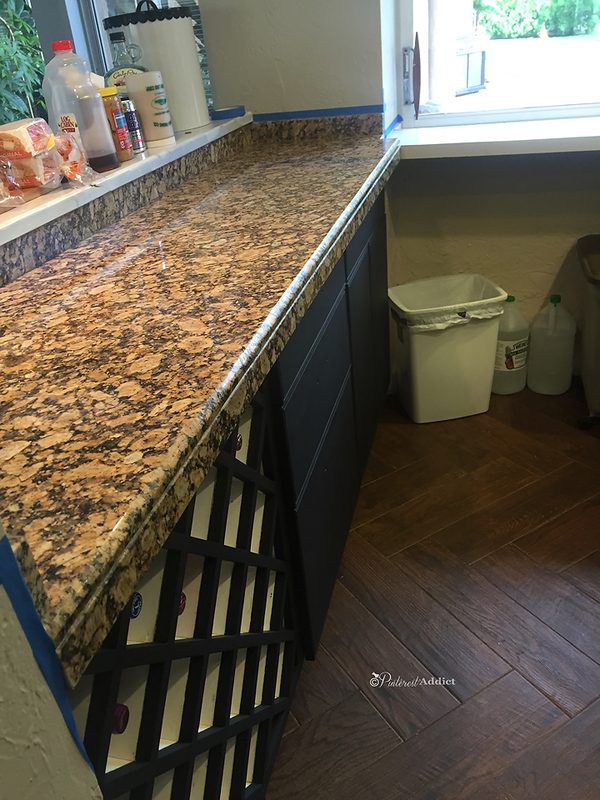 The photo of the kitchen was to show that the painted counters ended up about the same color as the kitchen quartzite, instead of the brown/black/beige colors they were. Great job. Does the sURface work well with heat and moisTure? Is it the same? It’s pretty smooth, like a wall would be, if you topped the paint job with clear sealer. can this be removed if someone ever wanted to take it off ?? I’m sure it could be, since it’s on top of granite. I’ve used citrus paint remover to take paint off a granite piece before and it was fine. I don’t know if I’d do it if I didn’t completely hate the existing granite.